What are Flame and Stux-net and why should I care? There has been much discussion in the popular press of late about something called Flame and something called Stux-net, especially with regard to national security. However, many people do not understand what they are and why they are so troubling. Basically both of these are “computer worms” which, like viruses, attempt to perform malicious acts to your computer. The difference between a “worm” and a “virus” really has to do with how they are propagated. Computer viruses are a type of malware that generally deletes or changes files. They must be permitted to execute code and write to memory, and so generally attach themselves to some program; when the user runs the program, he or she also runs the virus (unintentionally). A worm, on the other hand, can self-replicate and move through a network (like the Internet). Generally worms are designed not only to spread, but also to make specific changes to the computer, including taking control of all or part of the computer. The key to understand is that the worm can cause damage to the system. First, let’s talk about Stux-net. You may have heard about this one in 2010 when it was reported that there had been a cyberattack on Iranian uranium-enrichment centrifuges. This worm had been introduced into the Iranian nuclear processing facility (people in the know think it was introduced on a thumb drive), and it took control of the control system. A control system manages and regulates the machinery under its control, so that humans (often quite far away) can read sensors and information about they system and make adjustments. In this case, facility being monitored was Iran’s nuclear processing facility. The control system sent messages to uranium-enriching centrifuges to spin at speeds well beyond their tolerances. Obviously then the centrifuges were damaged. You might ask how the worm could have caused that problem. Well, the programmers of the worm found vulnerabilities in the computer programs that run the control system. It is the same process of programmers exploiting bad programming the operating system so our computers can get viruses. The worm caused so much damage to the facility that it has set back the nuclear program in Iran. At the time, there was discussion at the time that it might have originated in the United States and Israel, but there was no evidence to back up that claim. Uncounted numbers of industrial control computers, the systems that automate such things as water plants and power grids, were linked in, and in some cases they were wide open to exploitation by even moderately talented hackers. Last week the press identified a new worm deployed in Iran called Flame. This seems to be primarily surveillance malware that allows someone to turn on microphones, look at data, track what people are doing on a computer, and perhaps even listen to nearby cell phone conversations. This worm was deployed to the Iranian oil industry and was attaching itself to control systems for the rigs and other equipment. It was detected and the Iranian government has unplugged those facilities from accessing the Internet. It has also created its own task force to combat these attacks and claims it intends to build its own Internet. This same worm has been found in the Palestinian territories, Sudan, Syria, Lebanon, Saudi Arabia and Egypt. While the worms seem different, experts are not sure. They both move in the same fashion. In addition, computer experts say that the style of programming is similar between the two. Yes, it is true that there are styles of programming just as there are styles of writing. An expert can tell the reasons Emily Dickenson works are not confused with those of James Joyce. A computer expert can tell similarities in programming by how things are named, how they flow, and how different parts of the programs are hooked together. Worse yet, these experts claim to have found code that was apparently taken directly from Stux-net and put in Flame. All of those suggest similar authors. What is the take-away for us? All of this mischief has put a spotlight on the fact that we, as a society, depend on computers for much beyond the business and pleasure applications we generally discuss. Everything from the car you drive to the utilities use computers to control them. And, where there are computers, there are people contemplating ways of breaking them. Most of these controllers were not visible to the average user, so they did not get attention from hackers. However, that also meant that their manufacturers often got lazy in building in the security to protect them. Now that they have the attention of the hackers, companies are scrambling to protect their controllers. Otherwise, we may be in for some rough times ahead at malicious or inadvertent attacks on our infrastrucutre. To WiFi or Not to WiFi …. This month, the FBI’s Internet Crime Complaint Center issued a stark warning to travelers: If you use hotel Wifi hotspots abroad, you could get burned. The alert says cybercriminals are targeting travelers abroad using pop-up windows that appear while they are trying to connect to the Internet through hotel Wifi. The pop-ups tell hotel guests that they need to update a widely used software product. But when they click to install it, what they get instead is malware on their laptops. So, what can you do? If we follow our normal security procedures, download all software updates before you travel, only download updates directly form a vendor (and never click on a link in an email to do it), you are better prepared. You should also block popups because that is how the criminals advertise the software they want you to download. In addition, if you use free WiFi spots, it would be good to use a Virtual Private Network (Private VPN). The VPN encrypts all of your data thereby making it useless to the criminal who might intercept it. Without the VPN, your data is sent without any protection and someone with the right tools and abilities could intercept it and then use it for whatever purpose. The Private article recommends using PRIVATE WiFi™. Don’t ruin your vacation because you neglected security! There are two handy tools they provide, wonderful visualizations (as we will discuss in a moment) and an audio clue whenever information is being shared about your surfing. The audio clue is a clicking sound that resembles the sound of a typewriter key hitting the paper. I recommend you turn it on for a while because it quickly helps you become very aware of just how much information is being shared. The constant clicking when you select a link — and even clicking when you are not using your browser if you have a page open and it refreshes — helps to sensitize you to the amount of information being shared. After a while, it gets annoying, so remember how to turn it off too! Now for the visuals. I downloaded the application and began to do some surfing. 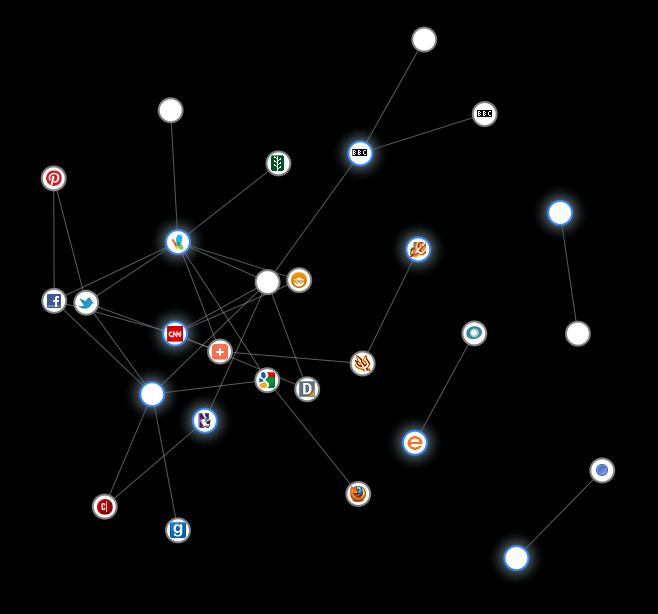 The map of the information sharing is shown below. The visualization is interesting. The circles with the halos represent places that you have visited during your surfing, while the circles in gray are ones you have not visited. An arrow from one to the other indicates that the first site has sent third party cookies to the other site. I recognize some of the icons like Blogger, LinkedIn, Adobe, Facebook, MSNBC, and Northwestern University. Others have no icons or they are not ones familiar to me. If you hover over any of the circles, you will get the URL for the site (for example as I hover over the Facebook logo, I see facebook.com). 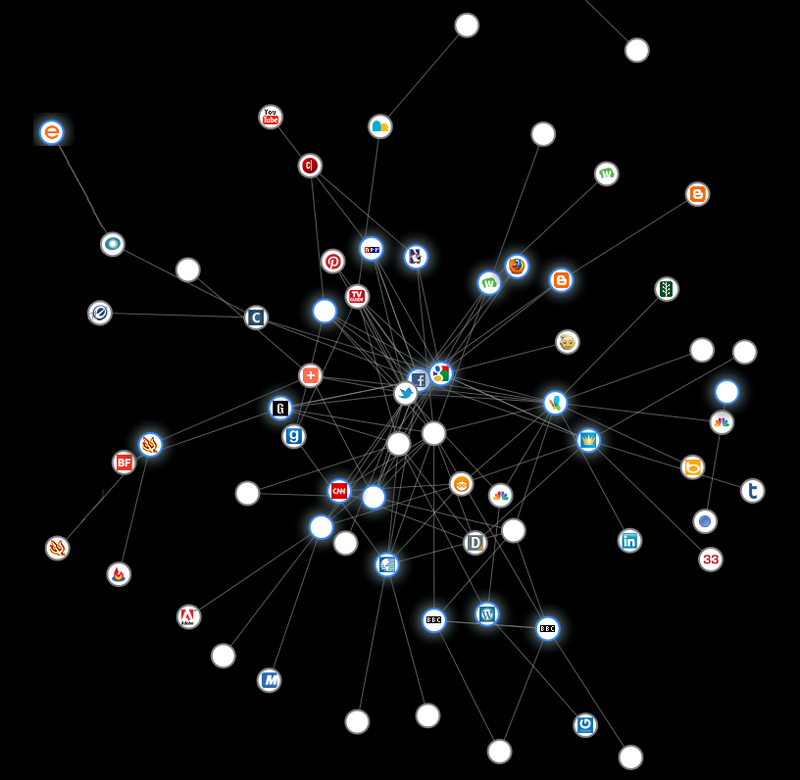 In addition, it will highlight all of the connections to and from that site. So, I see that Facebook sent third party cookies to bit.ly, cbs.com, and reference.com. I also see that cbs.com sent third party cookies to facebook.com. I was surprised by the number of hits and the links between the hits because I am careful about not accepting cookies from sites that I do not know. So, I decided to clean out all of my cookies and surfed some more. The number of hits reduced for a while as shown below. 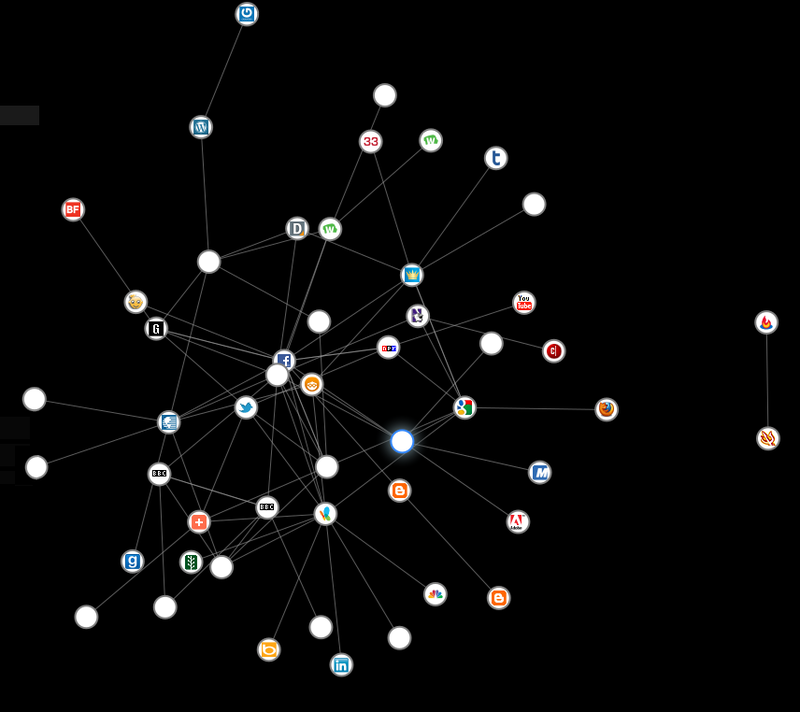 Things were a little better, but notice how much information is being shared even without the cookies. That is because the websites use third party applications to collect the data and share the data. If you did not think people were watching your behavior before, you certainly should be convinced with this image. Further, the links between the sites, where they now have joint data begins to paint a picture of who you are and what they might do to get or keep your business, or how they can sell your data to others who want to market to you. The creators of Collusion recognize that the tool is a work-in-progress. 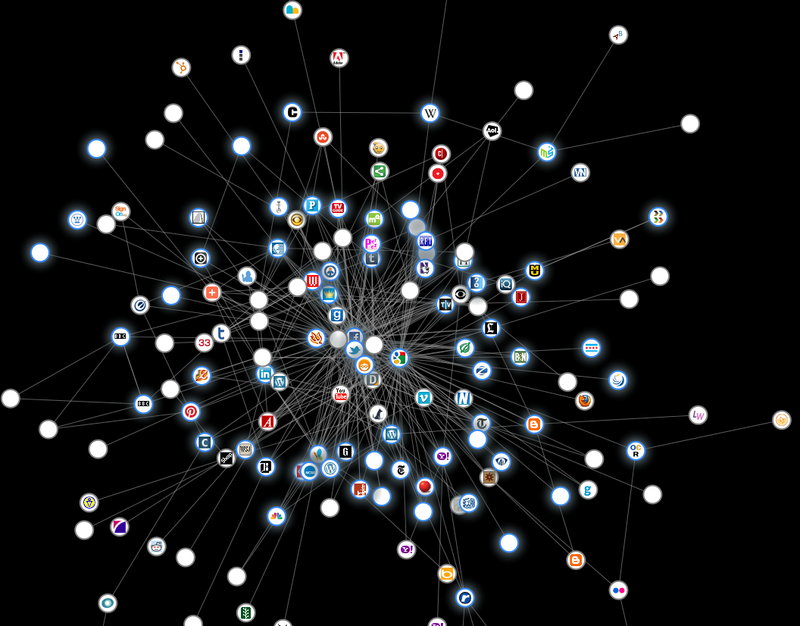 The website says they are working on adding more features, such as the ability to click on any node in the graph and tell Firefox to block third-party cookies to that site, and visualizing other methods of tracking besides third-party cookies. Using Collusion was an eye-opening experience. I am looking forward to that add-on that allows us to block these third-party cookies. What I do is private, right? Online banking makes paying bills and transferring money easy and fast. But are you sure that you are protecting yourself and your money? What would you do in the “real world”? First, you would want to make sure you were really at the bank, and that it is open. You would want to hand your checks and money to an official teller and get receipts of all of your transactions. In addition, you would probably get fairly suspicious if someone were looking over your shoulder or if you had to conduct your business through a third party (not someone who works for the bank). You would be wise to ensure that your records were accurate and that no one was stealing your signature or banking documents. Even if you follow safe computing practices, you may still be at risk thanks to a new kind of trojan (similar to a virus) that might have infected your computer, called a “Man-in-the-Browser” (or MitB) trojan. The trojan is a piece of software that does not install itself on your computer, but rather installs itself as an add-on program within your browser, without your knowledge. What happens is the MitB alters what the user and the bank see during the transaction. So, for example, the bank does not get correct information about how much money to pay a vendor, and you do not see how much money was actually reported. In fact, it might transfer money to another account and you might not be aware that it happened. Your virus protection examines all of the software on your computer by comparing it to known problems or peculiar behavior. Just as your police officers fingerprints and now DNA samples to compare to evidence at the scene of a crime, your virus protection compares strings of computer programs to those known to be viruses, malware and trojans. If those do not identify the perpetrator of the crime, they look for people who are behaving strangely. Likewise the virus protection examines programs for unusual activities, like replicating themselves, growing quickly, or accessing a number of services on the computers. Generally these strategies work well. However, MitB trojans are particularly difficult to detect since they change their appearance and behavior tens of thousands of times each day. A particularly good (and easy to understand) description of this phenomenon was aired on BBC News. Since they are hard to detect, it might take some time before your virus protection understands that there is a problem and by then it might be too late. There are some warning signs for this kind of problem. If you are asked for more information than normal during your financial transaction, especially if you are asked for passwords or sensitive information such as social security numbers. What do you do if you experience one or more of those symptoms? You should call your bank as soon as possible and give them the date and time of the transaction. Do not email your bank because the same software that interferes with your financial transaction may interfere with the sending of the mail. Your bank may have monitoring software that catches and disallows unusual transactions to protect you, so you may not have a problem. If you do, you will need to rely upon your bank’s policy as to how much you are responsible.